"This is a large recipe that is rich and dark. Make a few weeks ahead of time. Apple juice can be substituted for orange juice. Originally submitted to CakeRecipe.com." Preheat oven to 275 degrees F (135 degrees C). Grease four 9 x 5 x 3 inch loaf pans, and then line with brown paper or foil. Grease again. In a large container stir raisins, currants, candied fruit mix, candied cherries, maraschino cherries, dates, and 1 cup flour together until all the fruit is well coated with flour. Measure 2 1/4 cup flour, baking powder, baking soda, salt, cocoa, cinnamon, and nutmeg into a medium bowl. Stir to mix. In a very large bowl, cream the butter or margarine with the sugar. Beat in egg yolks three at a time. Stir in pineapple with juice and vanilla. Add flour mixture in 3 parts alternately with fruit juice in 2 parts to the creamed mixture, beginning and ending with flour mixture. Stir in walnuts. In another bowl, beat egg whites until stiff. Fold egg whites into batter, and stir in fruit gently. Divide batter among pans. Smooth. Bake for about 3 hours until an inserted wooden pick comes out clean. 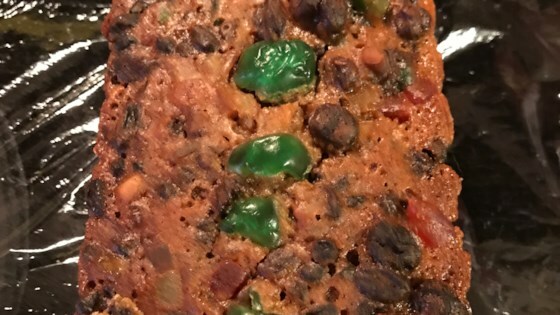 This light, delicious fruitcake features dried, not candied, fruit. make this 4 batches of this recipe every year for Christmas presents for friends and family, and it is well received. Instead of orange juice, I substitute double amount of Cointreau. Excellent recipe! I used smaller loaf pans and got 6 cakes from the recipe. I basted the loafs with rum for about 4 days and they are moist and delicious!